KILLS 99.99% OF BACTERIA WITH UV LIGHT. Our patented design is the only device that can completely sanitize your entire phone. 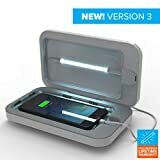 Sitting on a UV transparent plate, and surrounded by scientifically proven germicidal UVC light and a reflective interior, PhoneSoap kills 99.99% of all bacteria on your phone. FITS AND CHARGES ANY PHONE. PhoneSoap 3 fits all phones, including the larger phones such as the iPhone 8 Plus. It also has two charging ports on the back of the device, a USB and USB-C. You already charge your phone every night, now you can charge and sanitize at the same time. With PhoneSoap 3 you can charge a second device, such as a smart watch, at the same time. CLEAN WHATEVER FITS. While we have built PhoneSoap 3 around sanitizing phones, you can sanitize whatever fits inside. From pacifiers, smart watches and headphones to credit cards and keys.